Recent observations show the ubiquity of crystalline silicate in various objects, among which comets provide the best opportunity to study possible processing of pristine matter during their formation and evolution. While thermal processing of bare amorphous silicates in the hot inner solar nebula has been invoked, its drawback is a difficulty in explaining the interstellar composition of cometary ices. Here we apply a model of core-mantle interstellar grains to propose nonthermal crystallization of the amorphous silicate core due to the energy released by chemical reactions in the organic refractory mantle when moderately heated by solar radiation. By formulating the nonthermal crystallization, we find that the degree of crystallinity is determined by a single parameter that is proportional to the amount of the released energy. We show that the present mechanism of crystallization is capable of reproducing the strengths of crystalline silicate features observed in comets. Our model can reconcile crystalline silicate in the comae of comets with the interstellar composition of ices in their nuclei. The presence of crystalline silicates in comets was first identified by infrared spectra of dust in the coma of comet 1P/Halley (Bregman et al., 1987). Since then, infrared features of crystalline silicate have been observed in a number of comae, but the origin of crystalline silicates is a matter of debate. Experimental studies on thermal annealing of amorphous magnesium silicate smokes show that a dust temperature in a coma of a typical comet is too low for amorphous silicate1 to crystallize in situ (Hallenbeck et al., 1998, 2000). Therefore, thermal annealing of amorphous silicates in the hot inner solar nebula and incorporation of crystalline silicate into comet nuclei are suggested (see a review by Hanner, 1999). In contrast, the interstellar composition of gas in the comae indicates the preservation of interstellar volatiles in the cold outer nebula (Biermann et al., 1982; Mumma, 1996). To reconcile hot and cold materials, crystalline silicates are considered as being transported from the inner solar nebula to the outer comet-formation region (Bockel’ee-Morvan et al., 2002). Nuth et al. (2000) claim that the fractional abundance of crystalline silicate in the solar nebula increases with time and thus can be used to date a comet’s formation age. Harker and Desch (2002) considered in-situ annealing of silicate at elevated temperatures by nebular shocks that could proceed with crystallization up to 20 AU, depending on the model parameters (Nakamoto and Miura, 2005). Without the outward transport, however, the in-situ annealing mechanism predicts no crystalline silicate in the Kuiper Belt comets, contrary to observations (Watanabe, 2004). As noticed by Huebner (2002), none of the thermal mechanisms allow comets to retain the interstellar composition of ices in their nuclei. We notice that a detection of crystalline silicates in a cometary coma does not necessarily mean the presence of the crystallites in the nucleus. Comet nuclei may consist of interstellar ices along with interstellar dust that is almost free from crystalline silicates. If low-temperature crystallization of amorphous silicate, as pointed out by Molster et al. (1999), takes place in a comet coma, then one could automatically reconcile observable signatures of both interstellar ices and crystalline silicates in the coma. Recently, Carrez et al. (2002) have found that MgSiO3 glasses irradiated by 300 keV electrons crystallize at room temperature. We propose yet another nonthermal mechanism to preserve interstellar composition of volatiles in comets. It is considered that a comet is an agglomeration of interstellar dust consisting of an amorphous silicate core, an organic refractory (OR) inner mantle, and an icy outer mantle (e.g., Greenberg, 1982; Jessberger et al., 1988). Because of the fluffiness of cometary dust, crystallization does not make essential difference between the aggregates and their constituent interstellar grains. The radius of the amorphous silicate core of the interstellar grain is a = 0.07 μm and the thickness of the OR mantle is hr = 0.03μm (Li and Greenberg, 1997). We assume Mg-bearing glass as the main component of the amorphous silicate core (see Jessberger et al., 1988; Kimura et al., 2003). 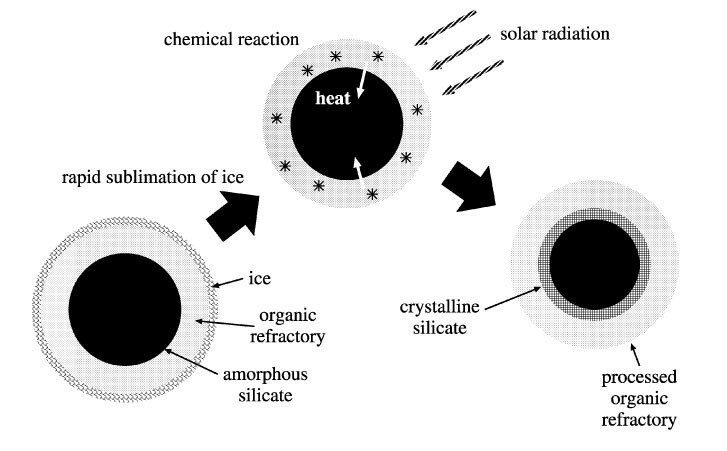 Figure 1 depicts our nonthermal mechanism of crystallization at moderate temperatures (Yamamoto and Chigai, 2005). A typical temperature of cometary dust is several hundred K at heliocentric distances around 1 AU from the sun. This is insufficient for the amorphous silicate core to crystallize but is sufficiently high for the icy mantle to sublime and produce the observed interstellar composition of gas in a coma. Such moderate heating also increases the diffusion rate of reactive molecules and triggers reactions among them in the OR mantle. In consequence, the energy released by the reactions increases the temperature and subsequently expedites further reactions. This is a positive feedback process resulting in chain reactions, a sudden rise in the temperature of the OR mantle, and heat flow into the amorphous silicate core. The heat flow brings about crystallization from the core surface towards the interior. Illustration of our nonthermal crystallization mechanism. where χ is the thermal diffusivity. Heating due to deposition of latent heat of crystallization and cooling due to thermal emission and sublimation of organic molecules are negligible because the time scales of these processes are much longer than that of heat conduction. This indicates that θ > 1 is the condition of substantial crystallization near the surface. The θ value being on the order of unity implies that amorphous silicates in comets do crystallize to a certain degree by the present mechanism. 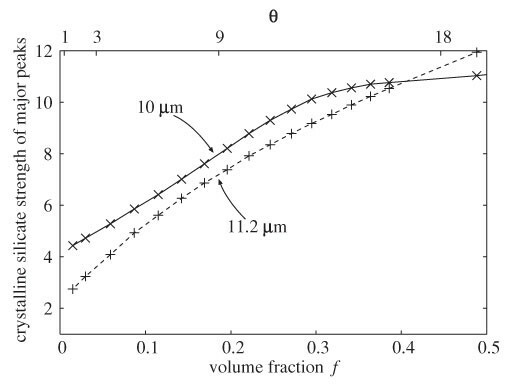 Figure 2 shows the degree of crystallinity ƒc(r,∞) calculated from Eq. (6) for θ = 0.9 to 9 (nr = 1021-1022 cm-3). Also plotted is the case for θ = 18 (e.g., nr = 1022 cm-3, Er = 10 eV) as a possible upper limit. The crystallized region is localized near the core surface and hence the assumption posed in deriving Eq. (6) is not violated. which gives ƒ̄c=0.4-20% for nr = 1021-1022 cm-3(0.9 ≲ θ ≲ 9) from Fig. 2. We focus for simplicity on the strengths of the major peaks at 10.0 and 11.2μm, which are attributed to forsterite. Figure 3 shows that the silicate peak strengths increase with crystallinity ƒ̄c The strengths at 10.0 and 11.2μm are comparable and, for θ = 0.9–9, the strengths of both peaks could reach up to 2-3 times the strengths due to amorphous silicate (ƒ̄c=0). These characteristics of the peaks are in harmony with infrared observations of cometary comae. 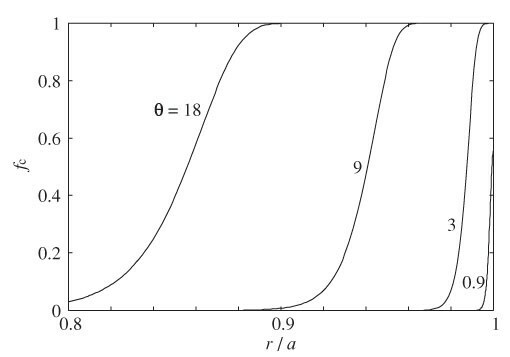 The degree of crystallinity ƒfc(r,∞) for θ = 1 to 18 as a function of distance r from the center of the silicate core having the radius a. We have proposed a nonthermal crystallization model of cometary silicate grains. The degree of crystallinity depends only on θ, which measures the amount of energy de26 posited in the OR mantle. The volume fraction of crystallites as much as 20% is realized depending on the θ-values. As shown in Fig. 3, the crystallinity obtained in the present model may reproduce the observed strengths of crystalline silicate features in the 8–13μm spectra. See Kimura et al. (2008) for discussion of the detailed spectra. In spite of the success in reproducing the observed infrared features, the present mechanism does not require mixing of amorphous and crystalline silicates. A natural consequence of the present model is that volatiles of interstellar composition may be preserved composition in comets. The present mechanism would also work for grains in other objects such as in protoplanetary disks if (1) the condition θ > 1 to induce crystallization is fulfilled and (2) moderate heating is available to trigger exothermal reactions in OR mantles. Crystalline silicates found in debris disks might be brought in part from comet-like objects in the disks. It is also possible to make crystalline silicate by the present mechanism in the vicinity of protostars. Recent observations showed the existence of crystalline silicates around protostars at an early stage of 105 years (Ciardi et al., 2005). This mechanism may also be triggered by shock waves and work at high temperature regions near O or B stars, although radiation pressure by these stars prevent any dust from staying in the vicinity of the stars. An upper limit of the degree of silicate crystallinity in the interstellar medium is estimated to be about 5% based on a comparison between a model and infrared observations (Li et al., 2007). To assess the degree of silicate crystallinity in the interstellar medium, it would be necessary to investigate the balance between the nonthermal crystallization and amorphization by cosmic rays. More observations of crystalline silicate features in low-temperature environments will provide a clue to specify the temperature that triggers the nonthermal crystallization. Our results show a possibility of efficient crystallization by nonthermal process. As stated in Section 2, our model permits amorphous silicate to crystallize above its melting temperature. If we exclude crystallization at higher temperatures than the melting temperature, we would have a lower volume fraction of crystalline silicate. On the other hand, our model neglects the finiteness of the particle size for the determination of the temperature. Actually the heat transmitted to the center of the particle cannot run away easily. As a result, the mean temperature of the particle would not decrease as we have modeled. We expect that this particlesize effect increases the volume fraction of crystal. Therefore, it is worth examining this nonthermal process more in detail by taking into account a more realistic crystallization model and the particle-size effect. Crystallization is a process for atoms to overcome an activation energy of crystallization at an appreciable probability. In general, low-temperature crystallization is possible if (1) a significant amount of input energy is stored and (2) there is a trigger to release the stored energy to induce crystallization. d’Hendecourt et al. (1982) observed that the energy stored in their OR is released at ∼30 K. Recently, Kaito et al. (2006) prepared particles of amorphous Mg silicate coated with amorphous carbon. They found that their crystallization temperatures are lowered substantially due to the energy released by graphitization of amorphous carbon. Inclusion of CH4 in the amorphous carbon mantle further reduces the crystallization temperature to room temperature (Kaito et al., 2007). Although their experiments does not necessarily simulate crystallization of cometary silicate, they prove that a silicate core proceeds with forsterite crystallization upon releasing energy in its outer layer. The temperature to trigger the nonthermal crystallization could be further lowered, if the stored energy is released at much lower temperatures. Experiments on a search for mechanisms of low-temperature crystallization are encouraged to better understand the ubiquity of crystalline silicate in various objects. We use the term “amorphous silicate” meaning noncrystalline materials with a stoichiometric silicate composition following the astronomical literatures, although it may not be a correct mineralogical term. We thank C. Kaito, Y. Kimura, M. Honda, and T. Nakagawa for useful communications. This work is supported by MEXT and JSPS under Grant-in-Aid for Scientific Research.